Team 1629 traveled across the country to Los Angeles, CA, to compete alongside the top 48 teams in the country. These teams were divided into two divisions with 24 teams each. There, Wesleyan placed 7th in its division and tied for 13th overall with a record of 7-5-0. Roman Darker won an All American Witness Award for his performance as a plaintiff witness. Full results here. 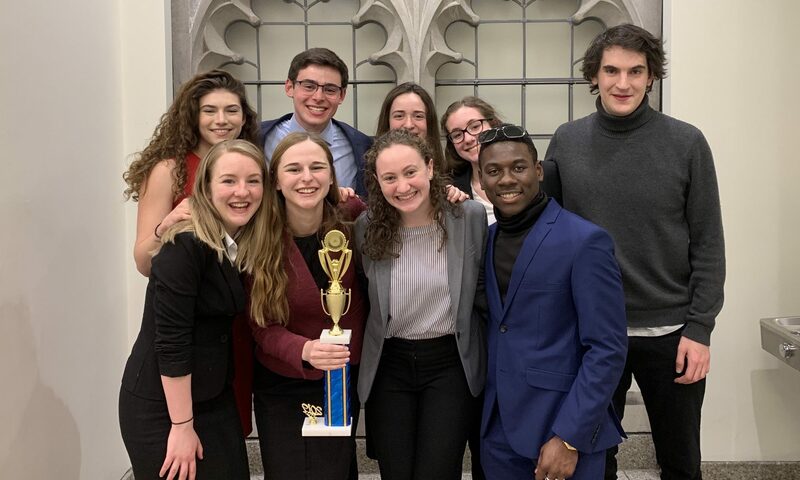 1629 placed fifth at the Central Islip Opening Round Championship Series with a 5-2-1 record, earning a bid to the National Championship Tournament for the first time in Wesleyan Mock Trial’s history! Erica Arensman won an All Nation Attorney award for her performance as a plaintiff attorney and an All Nation Witness award for her performance as a defense witness. Full results here. 1629 placed fourth at the New Haven Regionals with 6-2-0 record, earning a bid to the Central Islip ORCS. Molly Muoio won an All Region Witness award for her performance as a defense witness, and Erica Arensman won an All Region attorney award for her performance as a plaintiff attorney. Full results here.